I do love Christmas so much. The whole thing. I love all the busy, all the shopping, all the ridiculous. I love that our tree looks like it got really dressed up and then fell down a solid flight of stairs. I love that I knew what I was going for this year, but instantly had to let it go when I opened the ornament boxes. Five children, all hands in. Tree decorated in possibly 4 minutes. Every last ornament on. No theme, no balance, no sense of enough is enough. I wouldn’t be surprised if there were some Christmas throw pillows in there. The day after we got it decorated, Titus accidentally leapt off the arm of the chair next to it straight into the branches. He slid past several ornaments and four rounds of recklessly applied garlands, making a solid selection of the decor on the right side of the tree look rather adrift and certainly droopy. I love sharpies (I don’t listen, don’t bother to warn me about them) for writing names. So fast. Not fiddly. Come in good colors. 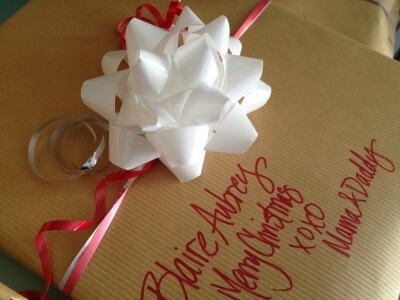 I love that Blaire prefers the bows for brooches, and removes them with haste from all presents that she notices. I am relieved that I am almost done with Blaire’s stocking, all but the toe and the holly berries. I love that this picture captures the droopy tree, the enormous advent calendar, the stocking, and the wild party animal that is Blaire. The double-point needles that she stabbed into my yarn in a gesture of goodwill. Most of all, I love Christmas for kids. I love doing things that are outrageously tacky because the kids will love it. Like maybe stringing a full string of FLASHING Christmas lights across the kids’ table at Sabbath dinner. We want them to feel like we are really classy, you know? any chance you want to share your caramel recipe…please?! and, yes I did ask in the last Christmas post as well, I REALLY want to try your caramels! 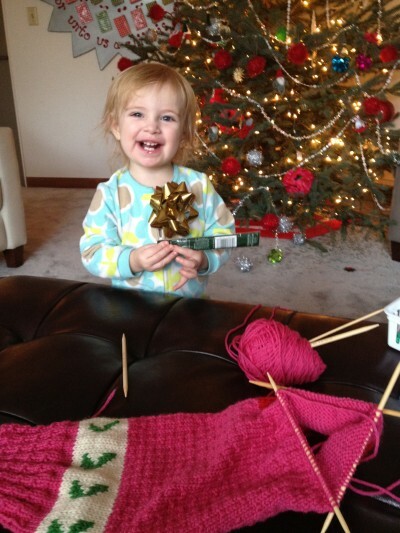 you are the world’s fastest knitter! that is amazing. and from that angle, the stocking may be large enough to contain that wild party animal. btw, that is a really cute kid’s table…i’m taking notes, possibly for a grown up table. but i will leave the blinking for another event. I *LOVED* this. Loved every word. I laughed hysterically and loved the spirit of it all. Perfectly funny!! Could have been written about our decorating experience…and I have the tree to prove it! Blessings to you, sweet Momma! I have an undying and deep affection for Sharpies . . . .
What is wrong with Sharpies?! I have a boatload—and I always ask for the pen kind (in lots of fun colors!) in my stocking. I l.o.v.e. them for lists and letters. And everything in between. I am pretty impressed that you have gifts already wrapped. AND that they have stayed wrapped! I usually wait until the night before. My family has nasty cases of the shakes and peeks-my husband is the worst of the bunch! I like your simple brown paper and red effect. That is great. We always have a Deck the Halls party where we invite no one but ourselves and make a big deal out of decorating the house. Thataway, everyone gets involved and has fun. The children think it is really special to have parties just for them (and not guests) every now and again. We listen to music, drink the first of the seasons eggnog and eat ONLY junk for dinner—summer sausage, cookies, mozzerella sticks, marshmellows, oranges. (Well, it isn’t ALL junk, just more like TREATS we don’t usually get. My favorite treat is NO COOKING OR DISHES!) 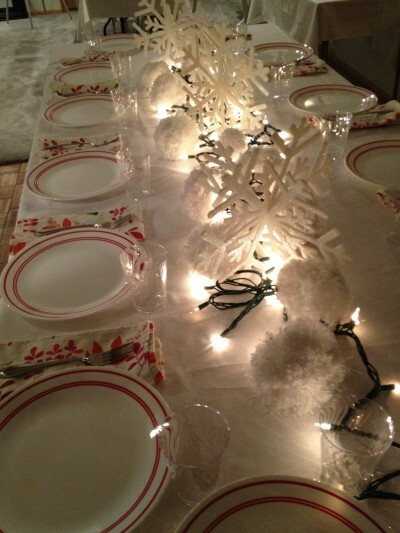 And I totally put twinkling colored lights on the food table! Working on a blog post about it this very day! Good stuff. I love that the kids’ table has cloth napkins and twelve (?) places. Christmas without kids is like coal in your stocking. I laughed so hard! My five year old helped me decorate the tree. She grouped like ornaments in clusters – holly berries in the front, gold ornaments on left, red ornaments on the right, pine cones in the back. She would place four or five ornaments on one branch, one in front of another. I realized her entire concept of Christmas decorating had been shaped by the ornament aisle of Walmart. I had to read this one aloud to all my family. It sounds so much like our “fanciness” except our children are older now. Fortunately, we still have a 7yo to keep us in the child-like spirit of Christmas. Are we the same person? Sometimes reading your posts I feel like we are living the same life. I too love sharpies and started wrapping everything in brown paper to simplify things. But no were not the same person, my only knitting accomplishment is a scarf I made in college that is almost to fat and short to wear. Thanks for the posts they always make me laugh and feel a little less crazy. 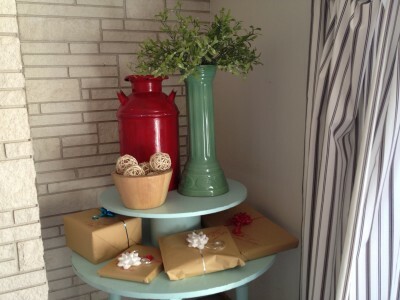 Can you do a post on your advent calendar…from what I can see of it, I love it! 🙂 Thanks for sharing what it is like to love the little years. I didn’t know sharpies and brown paper simplified things. I thought it was pretty and looks less comercialized! I did buy a print this year and it was so waxy the tape wouldn’t stick so I had to turn it to the brown side anyway!